Plastique, Drum/Percussion Sample from Analogue Drums. 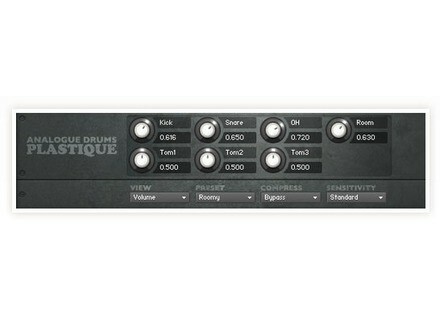 Analogue Drums has released two drum sample libraries in the Kontakt format. Plastique drives a classic rock track to add flavour to fusion and pop pieces. The kit itself is a vintage 1970s Ludwig Vistalite in Bonhamesque configuration and tuning, including two vintage Ludwig Supraphonic snares and Paiste 2002 cymbals. Round robin: each velocity layer contains 6 round-robin samples, played randomly. Multi-sampling: each key contains up to 8 velocity layers. Hihats are sampled with 7 articulations (tip, tight, closed, loose, semi-open, open, pedaled). Kontakt instrument interface: with separate volume and panning controls for individual drums, overhead mics, and room mics. Sensitivity control: increase the sensitivity of the kit for more subtle performances or leave it set to full dynamic range for rock and heavier numbers. Presets: for dialing up sounds. Rob Papen SuperEcho Rob Papen has released SuperEcho, a collection of patches by Antonio Sage and Bad Boy Bill for the SubBoomBass virtual instrument plug-in for PC and Mac.